Windows Live Mail is a comfortable email client that lets you manage and access your Windows Live Hotmail, Gmail and Yahoo! accounts in one place. But when your Windows Live Mail crashes or won't start, or you have to reinstall Windows Live Mail, is your windows live mail data safe? Will your email account lost if you forgot the password? Password Recovery Bundle is a simple and useful password toolkit that is able to recover forgotten passwords for all mail accounts in Windows Live Mail (Default mail reader in Windows 7). It works with all versions of Windows Live Mail, including Windows Live Mail 2009 - 2012. Password Recovery Bundle provides two methods of recovering your forgotten Windows Live Mail passwords. Select the Email Password -> Windows Live Mail Password option. The program will automatically search the profile of Windows Live Mail on the local computer, instantly decrypt and reveal your email account passwords stored in Windows Live Mail. Launch your Windows Live Mail client. Right-click on your email account on the left pane, and choose Properties from the menu. Click the Server tab. 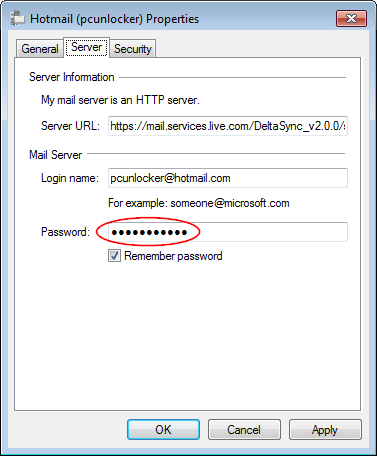 If your email password has been remembered by Windows Live Mail, you'll see a sequence of asterisk ('****') characters in the password box. Now run Password Recovery Bundle. Click the Start Recovery button, then select the Asterisk Password option. The built-in Asterisk Password Recovery tool will appear. 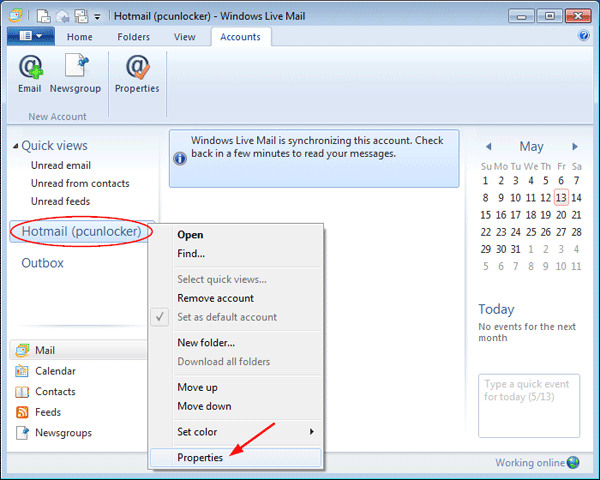 Click on the icon , drag the icon to the password box in Windows Live Mail. The actual email password hidden under asterisks will be revealed instantly!